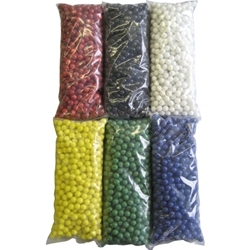 This is a case of 6 different colors (red, yellow, blue, green, black, white) for a total of approximately 3000 5/8" marbles. Perfect for all game board makers. Sizes may vary slightly. Warning! : Choking Hazard. This toy is a marble. Not recommended for children under 5 years.